And today, we have a quick preview. And this preview is literally quick. I went to South Africa to learn how Cape Town avoided becoming the first major city in the modern era to run out of water. And as I was reporting that piece, which we'll hear next week, I stumbled upon this - a two-minute story about two-minute songs. ROUGE: (Rapping) Don't it feel like deja vu, de-de-deja vu? Don't it feel like deja vu...? SHAPIRO: When Cape Town's drought was at its worst, an insurance firm decided to help get the word out that people needed to save water. The company hired a communications firm called King James. SUSAN VAN ROOYEN: I'm Susan van Rooyen, 30 years old. And I'm a copywriter. MOE KEKANA: And my name is Moe Kekana, 28 years old and art director. SHAPIRO: The pitch was make a billboard telling people to save water, which seemed kind of boring. VAN ROOYEN: But then we kind of got brainstorming. And we came up with this 2-Minute Shower Songs campaign. MI CASA: (Singing) Wake up, nana. SHAPIRO: Cape Town's government was asking people to take showers that lasted two minutes or less to save water. VAN ROOYEN: What do people do in the shower? You know, they sing. SHAPIRO: So the team asked South Africa's biggest pop stars to record new versions of their most famous songs, versions just two minutes long. KEKANA: I remember sending an email where somebody said, how many do you want? I was like, well, I could live with four or five, but 10 would be the dream. And we got 10. VAN ROOYEN: So we went into studio. We recorded with 10 artists in two weeks, and we basically created an album in under a month. SHAPIRO: The idea is you hit play as you jump in the shower, sing along and finish by the time the song ends. VAN ROOYEN: And some of them even changed their genre. GOODLUCK: (Singing) We're taking it easy. We're taking it easy. VAN ROOYEN: For instance, there's a - you know of Goodluck? They kind of went from a chilled, like, house track to a drum and bass. VAN ROOYEN: So it was a challenge for them. And what was so nice is translating the sense of urgency of the drought into the song. KEKANA: My favorite is definitely Desmond and the Tutus. DESMOND AND THE TUTUS: (Singing) Let's act like teenagers. KEKANA: That was also a major shift in how they did it. And this was all done in three days, from notice to recording. DESMOND AND THE TUTUS: (Singing) I need your face where my face is. You know the place. Let's act like teenagers. SHAPIRO: Pop stars are not exactly superheroes. But in this crisis, everyone had a role to play. KEKANA: One of the lines we used was the album about people singing to save a city. VAN ROOYEN: Sometimes you don't know what you can do to help within a crisis, and they were doing what they do best. FRANCOIS VAN COKE: (Singing in Dutch). 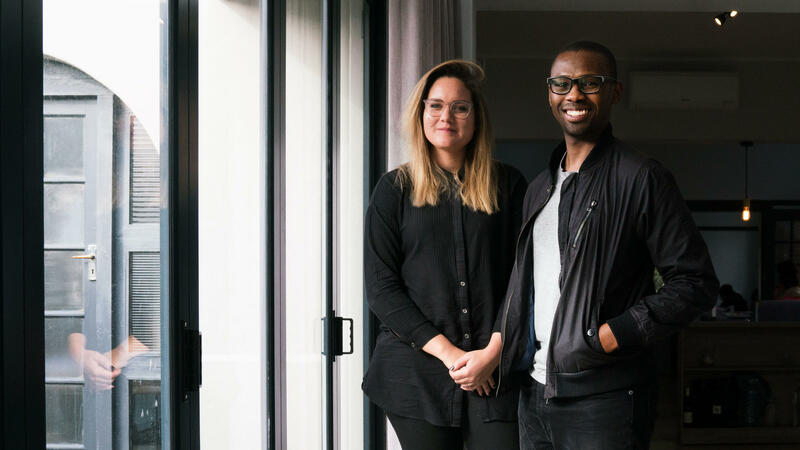 SHAPIRO: That's Susan van Rooyen and Moe Kekana, creators of the 2-Minute Shower Songs campaign that helped Cape Town get through the worst drought in the city's history. All next week, we'll have more stories from the water front. VAN COKE: (Singing in Dutch). Transcript provided by NPR, Copyright NPR.